This game, words cannot even describe my distaste for this horrid game. 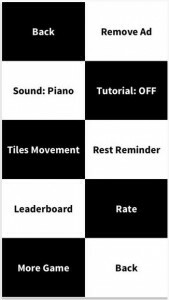 Maybe the white tile glows red when you hit it, because satan is behind the creation of this time consuming, life ruining game. I have found myself not sleeping, fearing that as soon as I doze off, that annoying note will blare through my head like a police siren. I can’t walk through my own kitchen, because the whole floor is white tile! A simple trip to the grocery store has become a traumatic experience for me, as well as my friends. Flappy bird looks like a tweety bird flying on a rainbow compared to this monstrosity. This isn’t a game, this is the devil. Jesus will not let you through the pearly gates into heaven, just because y’all created this game and ruined the human race. But Imma still play it though.